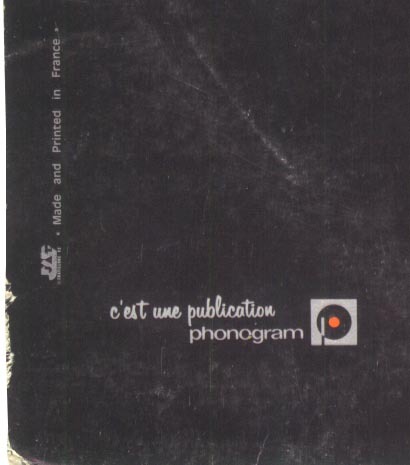 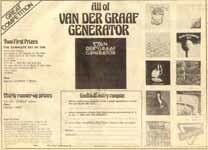 The original album contained a sleeve liner with lyrics. 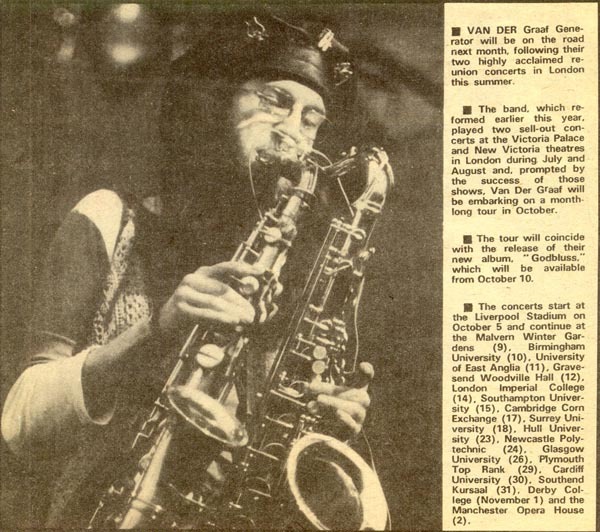 in NEPAM in November 1975. 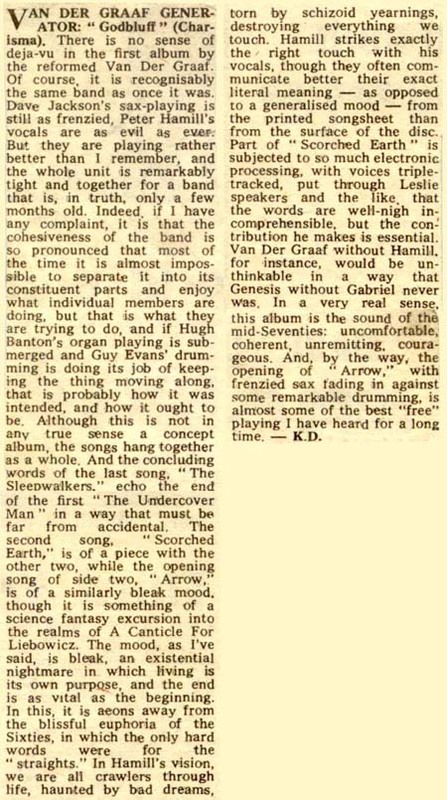 Sounds - "Simply, an essential buy." 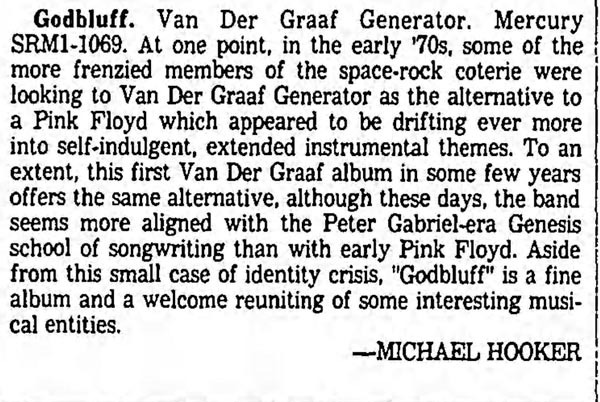 Music Week - "...receptive public..."
LA Times - "Godbluff is a fine album"
Record World (USA) - "...fire and brimstone." 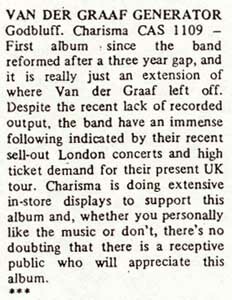 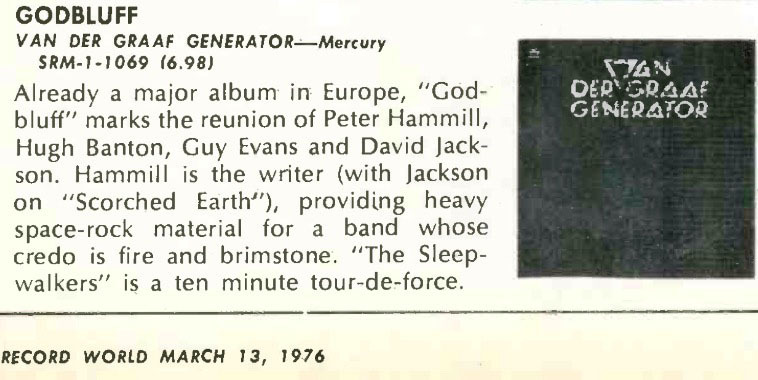 The Times (Munster/USA) - "Powerful"
in October 1975 appeared in Music Week. 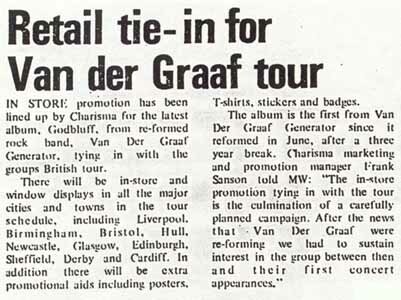 Retail tie-in for Van der Graaf tour. 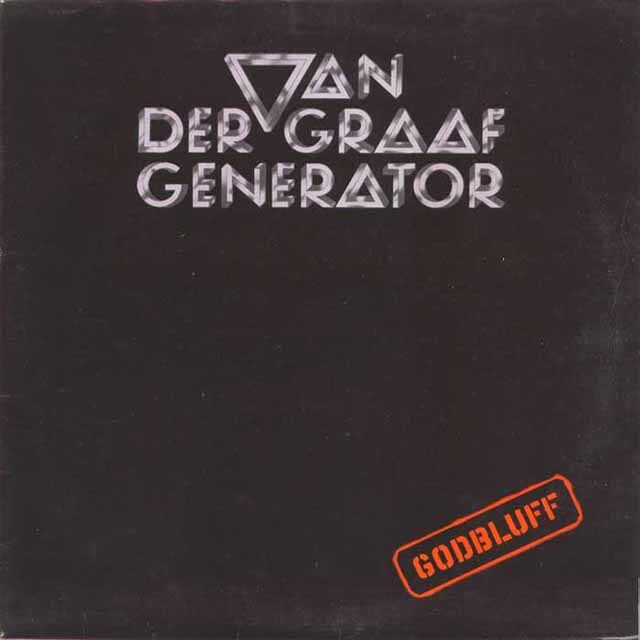 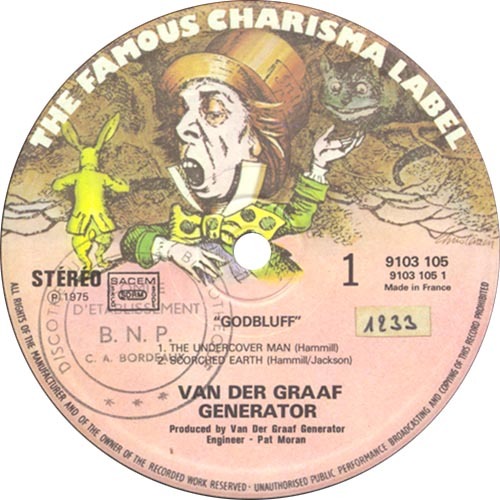 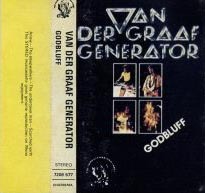 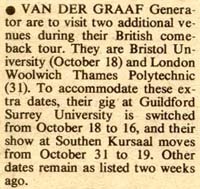 THE Re-birth - yet again - of Van der Graaf Generator earlier this year caused something of a storm. 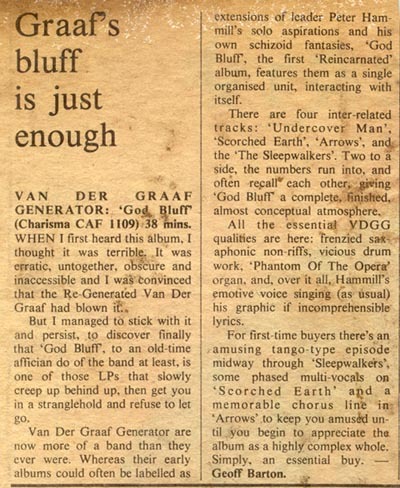 But the band's latest release does nothing to convince the listener that the new VDGG will last any longer than its forerunners. 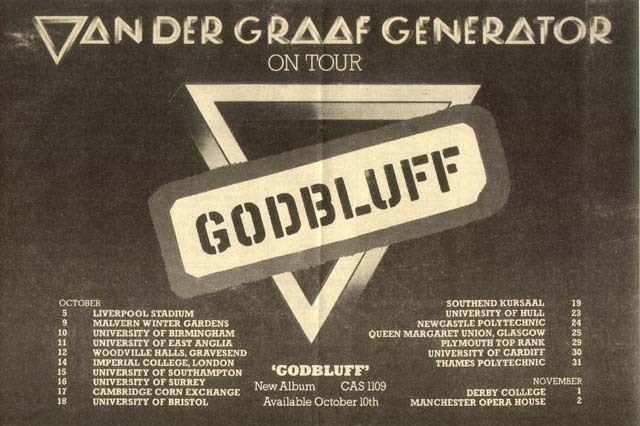 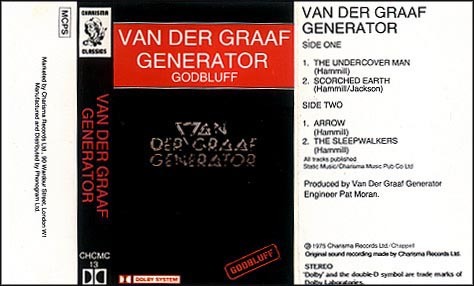 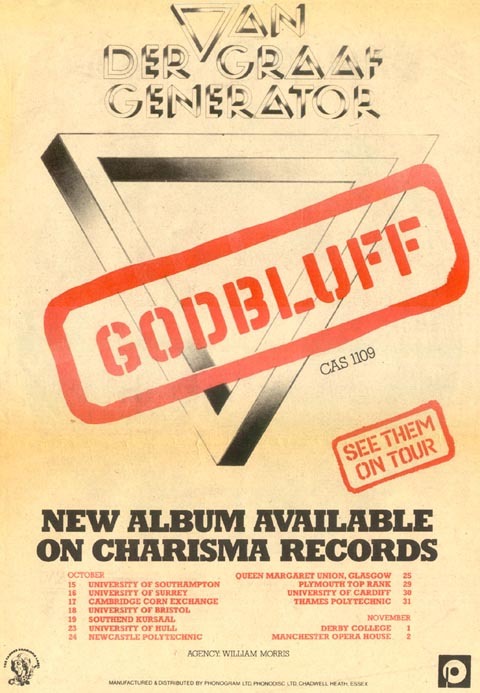 Godbluff is a lengthy exhibition of the type of studiously avant-garde rock which so many other groups play infinitely better. 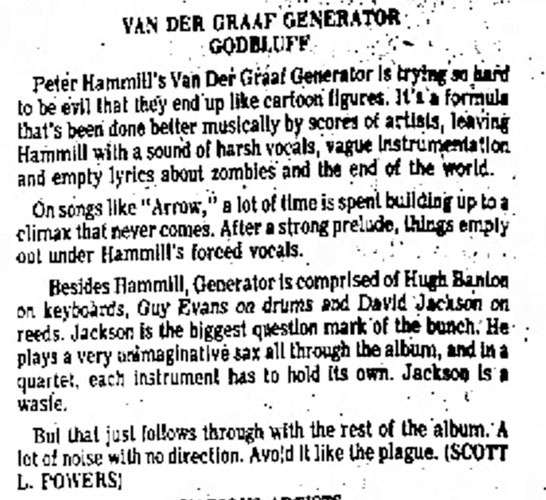 The one saving grace for the whole album is the occasionally impressive bass playing of Hugh Banton. 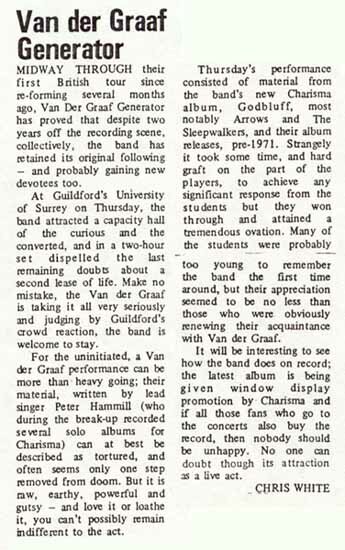 And even then, he only shines on about 5 per cent of the four-track, 37 minute recording. 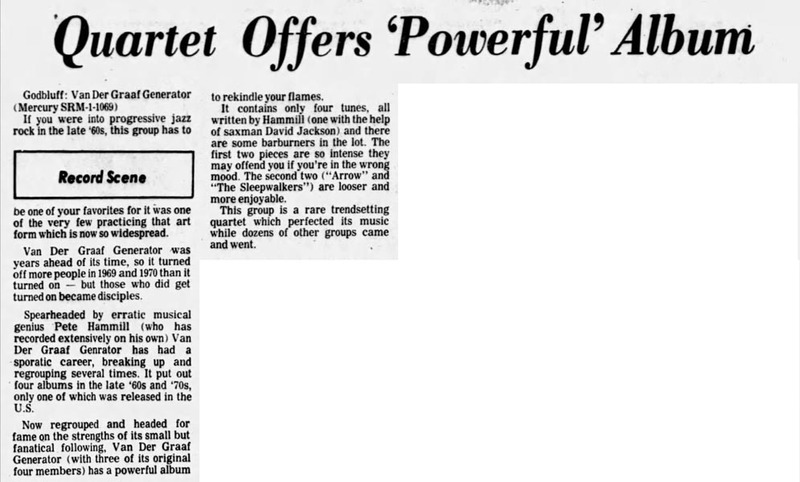 Guy Evans couldn't drum his way out of a paper bag and David Jackson's saxes and flutes are a little too simplistic to be credible. 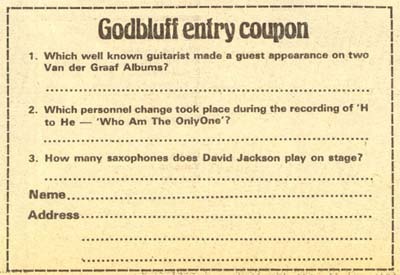 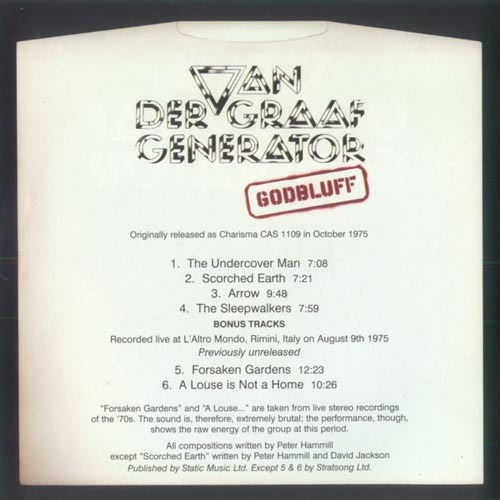 Sounds of Oct 26th 1975 carried this Godbluff competition. 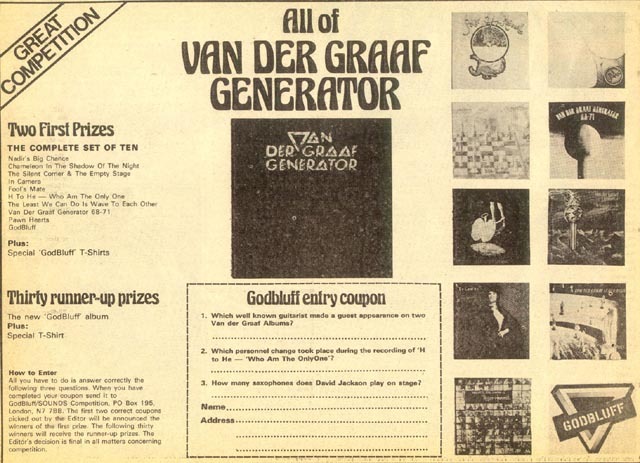 Alan Terrill sent me this list of competition winners. 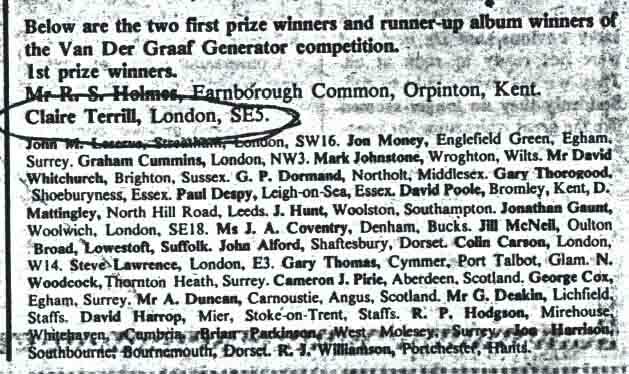 His wife Claire won a top prize. 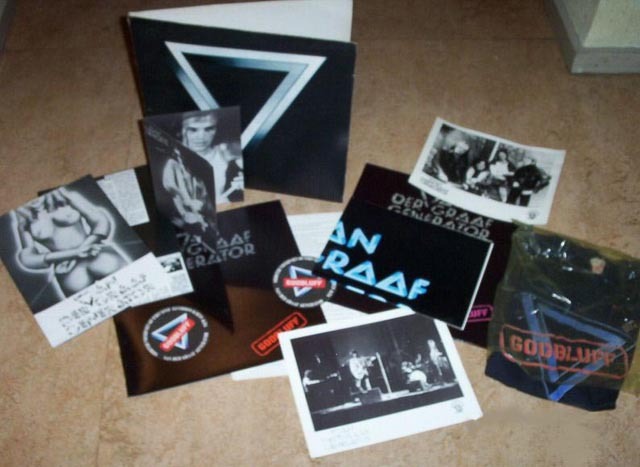 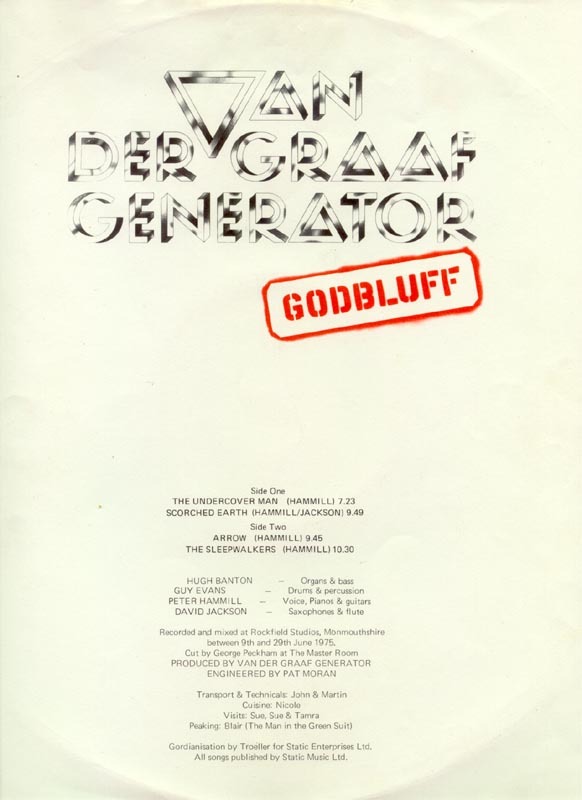 A Godbluff press kit, sold on Ebay in October 2003 for about �300. 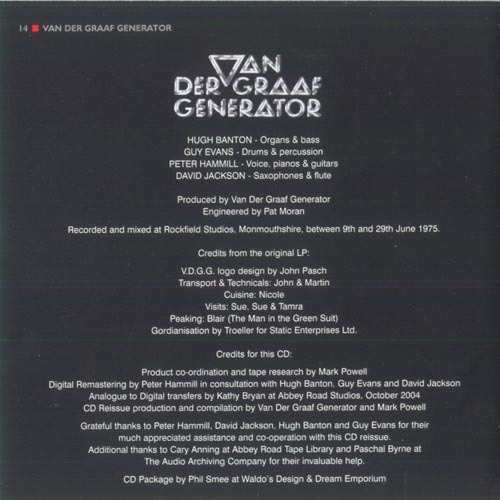 Re-mastered album released on June 27th 2005 with bonus tracks. 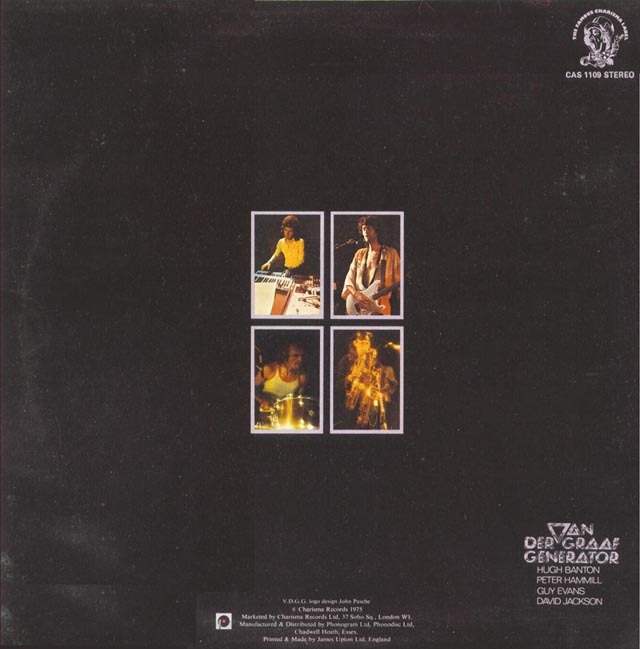 Tracks 5 and 6, from the album The Silent Corner And The Empty Stage, were recorded live in Rimini on 9th August 1975 (see also The Box for other songs from this concert).